Renovating the sanctuary was part of the final phase of this major project and we are incredibly honored Faith Presbyterian chose to have their custom furniture built by King Church Furniture. Before getting started on the 113 custom crafted pews, we field measured the sanctuary and worked with the church to adjust the layout. Each pew was constructed of oak wood with Minwax honey finish and covered in a beautiful neutral fabric that the church selected. Along with seating for the congregation, they needed a new pulpit and communion table, baptismal font, choir and organ screens, as well as a wall cross. We constructed custom mitered choir and organ screens and built the large, 15’8 x 10’8 wall cross based on their designs. Once the manufacturing process was complete, we loaded 4 trucks (an entire truck was required for just the wall cross) and delivered to the church. After 2 ½ days of installation, the sanctuary was transformed. To see more of this project, visit http://www.faithcapecoral.org/faith.com/videos/Faith%20Sanctuary%20Construction%20Timelapse.mov. Another happy customer and church family! Sherry & all the staff at King Church Furniture, Inc. Thanks so much for the job you guys did on our new pews. Your service and professionalism were very much appreciated. Everyone loves the pews and has complimented you all on a job well done. May God bless you all. Everyone at King Church Furniture takes pride in every build, installation or renovation of church furniture and the installation recently completed for Mercy Missionary Baptist Church is no different. The installation of church pews is the final, and the most important step to any church sanctuary and the attention to every detail is the number one goal of King Church Furniture. Mercy Missionary Baptist Church has a stunning sanctuary, and we feel privileged to have been a part of the installation of their beautiful new church pews. 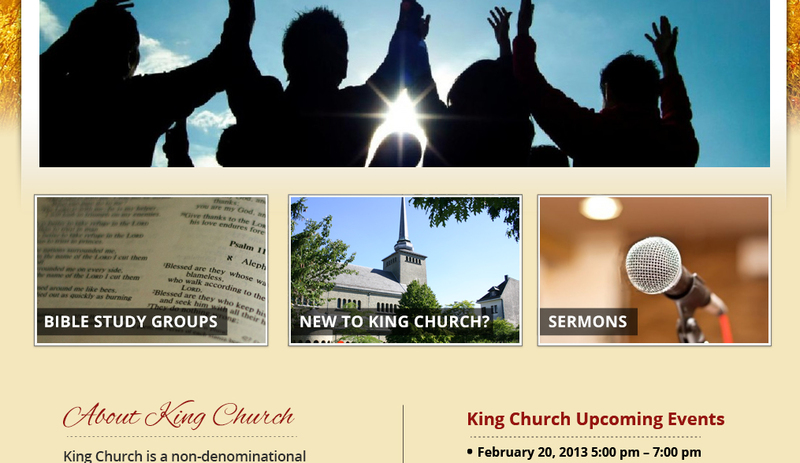 King Church Furniture has developed a free WordPress theme for Churches and it can be downloaded here. 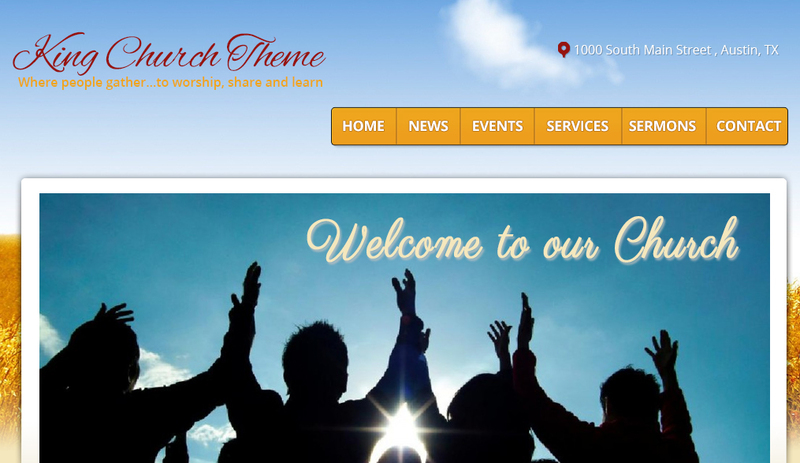 This theme will allow any church to have a professional website presence for absolutely no cost. WordPress is one of the most popular web platforms on the Internet, running almost 1 out of every 4 websites. Best of all it is free and very easy to learn and use. Area where your logo can be uploaded. 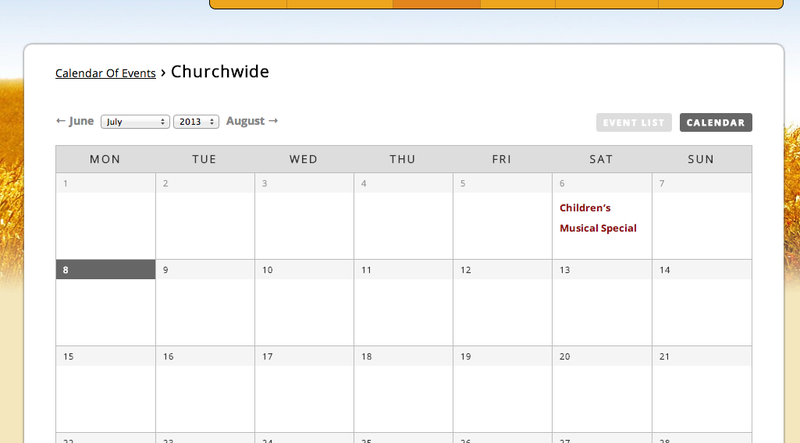 If not logo is uploaded, the name of your church or church’s website will appear in its place. Image slider for the home page. Each image can be linked to any page you wish. Front Page News area where you can post images, information, and links to current or upcoming church events. News area where church news can be posted. Sermons area where you can post information or transcripts of upcoming or past sermons. Changeable background color and images. Optional “fill in the blank” areas for church address, Facebook & Twitter profiles, copyright information, and Google Analytics tracking code. Added support for an event page. Download the King Church Theme here. 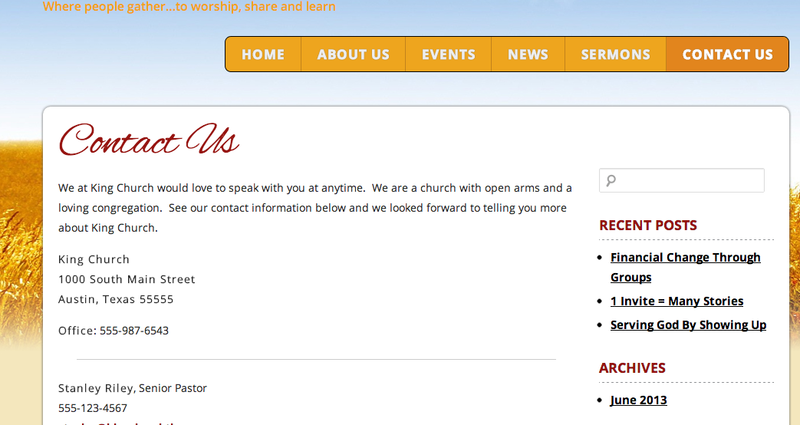 Log into your church’s WordPress website. If you do not have a WordPress site set up for your church please read the instructions for installing WordPress. Once logged in to WordPress, go to Appearance->Themes. Click the Install Themes tab. Click Upload to upload the theme. Click the Choose File button or Browse button and find the theme zip file you downloaded in step 1. Upload and install the theme. Once activated you can begin configuring the theme’s settings for your church. Need help getting your website going or have a question about our theme. Contact us here. I did not get to see our new furniture until yesterday. sure I was in the right church! What a difference! with our carpet. On a scale of 1-10, I would say at least a 15! Appreciate all your help . Great working with you. 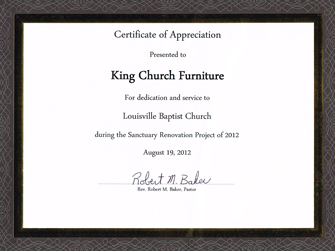 One of King Church Furniture’s specialties is refinishing and reupholstering church pews. We love to be help churches with all their speciality needs to breath new life into their sanctuary! 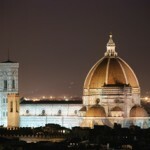 We’ve chosen ten churches all across the world to be recognized as our Top Ten Stunning Sanctuaries. When looking at online photos of these worship centers, it’s only natural to wish you could travel to see these places and see them for yourself. Our choices were mainly decided on by architectural beauty or distinctiveness, but many of these churches have interesting histories as well. We’ve included a brief description about each of our favorite choices around the world of churches. It was hard enough to narrow the list down to ten, so here’s our list in no particular order. We hope you enjoy this post as much as we did! 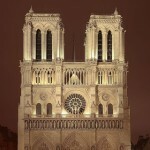 French for “Our Lady of Paris,” Notre Dame de Paris is one of the largest and most well known churches in the world. Part of its familiarity comes from its shrine, which holds the professed crown of thorns, a small portion of Jesus’s cross, and one of the crucifixion nails. The architecture of the church is also quite notable. This cathedral was one of the first buildings to use flying buttresses for support, and has many gargoyles and grotesques throughout. After nearly a 200-year construction process, the magnificent church was completed and is now among the largest and most well-known churches in the world. 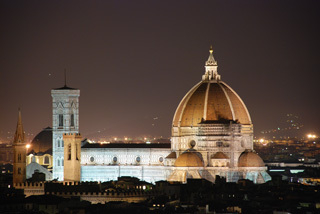 The Duomo di Firenze, also known as the Florence Cathedral was built between 1296 and 1436 in Italy. One of the largest churches in the world, it hosts a gothic front façade, with a limited amount of interior decoration, with the exception of the elaborate marble flooring, and the painted fresco of the Last Judgment on the dome ceiling (the largest dome in the world at the time). Even though the interior of the church has minimal color, there is actually a museum devoted to works of art strictly from the cathedral. 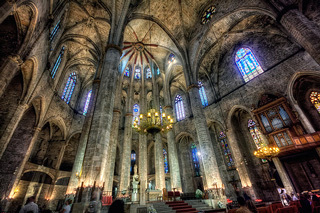 The Santa Maria del Mar, designed in 1324 and completed 55 years later, is considered the finest example of Catalan Gothic architecture in existence. During the 1960s, excavations under the church revealed that the church’s grounds had previously been used as a Roman cemetery during the 4th through 6th centuries. 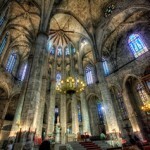 During the Spanish Civil War, locals burned out the interior after the Church turned their back on the people. Since then, smoke continues to darken the walls of the vault, but it is still a beauty to behold. This stunning Russian-style church has a unique story behind its construction and name. In 1881, Emperor Alexander II was assassinated by a group of radicals who threw a bomb at his royal carriage. This event ended the string of efforts to take the life of the emperor who had earlier freed Russian serfs and made many attempts at military, judicial, and urban reform. 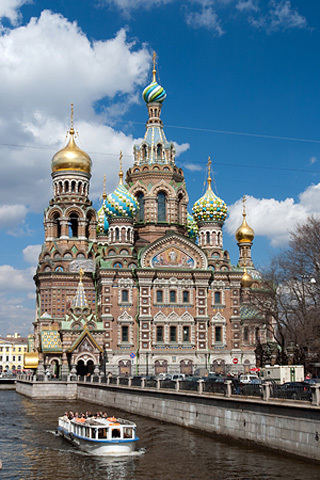 After the assassination of Alexander II, a decision was made to construct a church, almost completely funded by the royal family and many private investors, at the location where the assassination took place. The “Blood” mentioned in the church’s common name, refers to that of Alexander II, as well as the crucified Jesus. The Russian Orthodox cathedral even showcases a marvelous shrine on the exact place of Alexander II’s death. 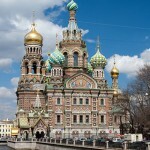 After much history in the 1900s, the church is no longer functioning as a full-time place of worship, but has become a major tourist attraction for St. Petersburg, Russia. 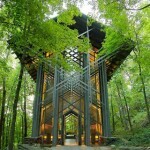 Nestled in the Ozark Mountains of Arkansas, this modern church was built during 1979 and 1980 out of pinewood beams and glass windows, and even appears to be an open-air space. The Thorncrown Chapel has won numerous architectural awards, been showcased in many major magazines, appeared on television programs, and been visited by over 6 million people since it’s opening in 1980. The church is now open daily for touring with free admission, along with church services April through December, and weddings and special retreats available throughout the year as well. 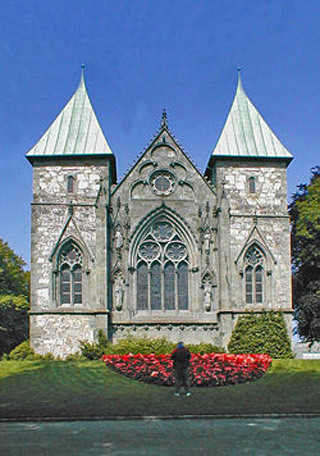 The Stavanger Cathedral was built shortly after Sigurd Jorsalfarer named Stavanger, Norway a cathedral city, around the year 1100. It was not completed until roughly 1150. About a century later, the church’s Anglo-Norman style was damaged by fire, which allowed some reconstruction to follow a Gothic style instead. 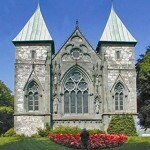 To this day, Stavanger Cathedral is the oldest Norwegian cathedral and has been in use ever since its founding. The Chesme Church was consecrated in 1780, to commemorate the tenth anniversary of Russia’s naval victory at Chesme Bay, and also John the Baptist’s birthday, both giving way to the naming of the church. 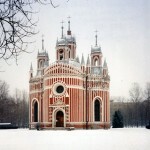 This church has been described as having a “wedding cake structure”, which makes it unique from many other Russian cathedrals. 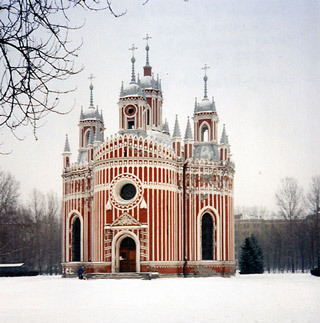 Also known as The Church of the Birth of St. John the Baptist, it still holds regular services today, even after its unique history of being turned into a labor camp by the Soviet government, and later becoming a burial ground for those killed in war. 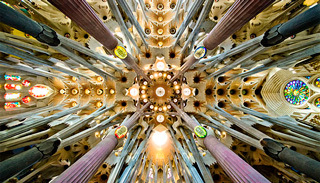 In 1882, construction began on this uniquely designed church which has become Barcelona’s most popular tourist site. 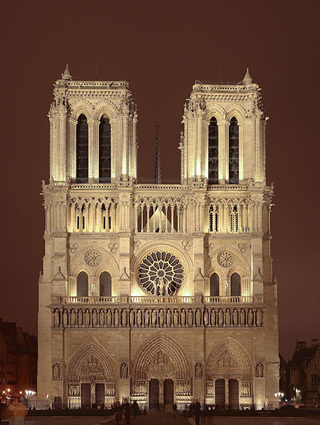 The original design has not been completed, due to the unexpected death of the primary designer and builder, however it is still certainly a majestic tourist attraction. 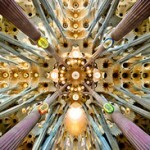 The original design called for 18 columns to represent the Twelve Apostles, the Four Evangelists, the Virgin Mary, and Jesus Christ. There are also three large facades decorating the building, including the Nativity, the Passion, and the Glory facades, each representing significant Biblical history or prophecy. One of the most distinctive aspects of the interior of this church is its interior columns that evolve into different geometric forms as you look further up the column. 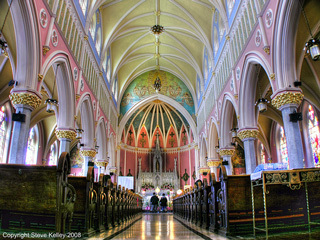 Founded in 1887, St. Bridget’s Church in New Jersey, this is one of America’s most beautiful worship centers. Today the church includes the parish business office, a growing day-care center and school, and a religious education center for children and adults. 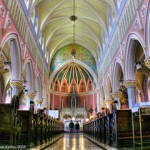 Many of the current church members are descendants of the Irish, Italian and Polish settlers who founded St. Bridget’s Church, along with many Filipino and Spanish locals. As a special touch to the worship service, this church has two volunteer choirs, one in English and one in Spanish. 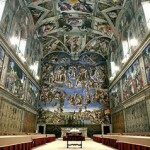 And what would a list of the top stunning churches or sanctuaries be without the famous Sistine Chapel? Built in the Vatican City during the late 1400s, at the commission of Pope Sixtus IV, the pope’s chapel has become a hugely popular tourist attraction. 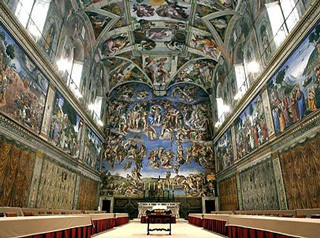 So much history and beauty lies in the walls of this chapel, most remarkably the artwork of Michelangelo Buonarroti. After a request to paint the Twelve Apostles and a few ornaments on the ceiling, Michelangelo found himself deeply involved in this project and his final work ended with over 300 human figures. His work between 1508 and 1512, in cramped areas on high scaffolding, produced 9 scenes from Genesis, 7 prophet paintings, and the world-renowned “Last Judgment” on the altar wall. Mr. Shouppe, the shop foreman for King Church Furniture gives a quick tour of the manufacturing facility and processes. Prior to the protestant reformation, church pews were not a very common feature in churches. Only when the sermon became the central act of worship during the 14th century did the church pew become a standard item in most churches. As the church pew became more common, they were sometimes installed at the expense of church members and they became personal property. In fact, pew deeds were used to record conveyance of a pew from one party to another. Some pews were even enclosed in pew boxes which could be locked to prevent others from gaining access. 3. Church pews had windows? Box pews, pews that are encased in paneling, were popular in many protestant countries from the 16th to early 19th centuries. Box pews could contain windows, curtains, tables, and fireplaces. Until the mid-twentieth century it was not uncommon for churches to rent pews to families or individuals. In congregations such as these pew rents were a primary means to raise church revenue. 5. The earliest recorded instance of sitting in church. Sitting during a service is first mentioned in the Bible. Unfortunately it did not end well. Another Happy Customer! We recently received another wonderful thank you letter from Rev. Robert M. Baker on the restoration we completed for his church in Louisville, Alabama. We greatly enjoyed bringing new life to Louisville Baptist and we can’t wait to help them in the future with any other needs. project would have never reached completion. The sanctuary and grounds look beautiful! Please accept this certiﬁcate on behalf of Louisville Baptist Church in appreciation for all of your dedication and service. Again, thank you so much for helping us complete the renovations.